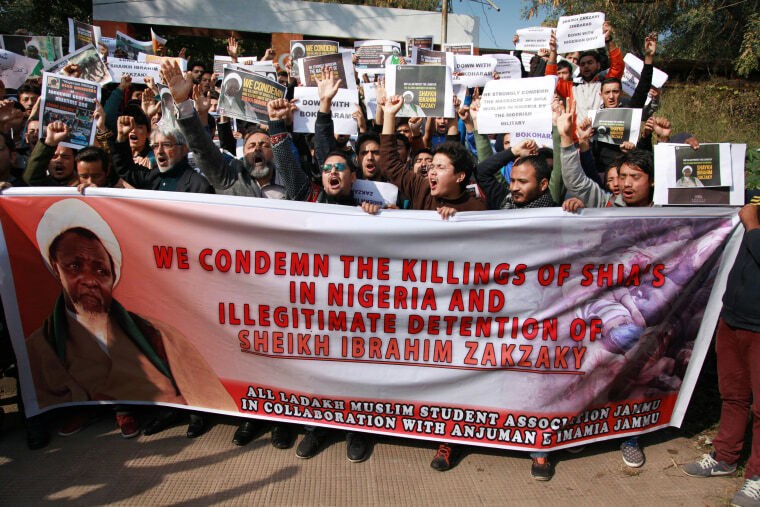 The U.S. on Wednesday joined urgent calls for an investigation into an alleged massacre carried out by Nigerian troops against Shiite Muslims in the country's north. The bloodshed began over the weekend when Nigeria's military said Shiites attacked the Chief of Army staff's convoy in Zaria in an apparent assassination attempt. "The sect numbering hundreds carrying dangerous weapons, barricaded the roads with bonfires, heavy stones and tires," the Army said in a statement. "They refused all entreaties to disperse and then started firing and pelting the convoy with dangerous objects." It said soldiers had "no choice" but to defend the convoy "at all cost," adding in a statement two days later that the "loss of lives" was "most unfortunate." The Shiite Islamic Movement of Nigeria, or IMN, rejected that account. It said scores of its members were killed, "centers destroyed and burnt to ashes" in subsequent raids. There were conflicting reports of how many were killed in the initial incident — or in the subsequent raids in Zaria near the home of the sect's founder, Ibraheem Zakzaky. A statement attributed to IMN spokesman Ibrahim Musa said "about a thousand" members of the sect had been massacred. Musa was later quoted by the Associated Press as saying that about 200 bodies were taken away from the area about Zakzaky's home in Zaria on Monday. The IMN — along with human-rights organizations — said Zakzaky's relatives were among the dead and that the leader himself had been injured and arrested. The U.S. said it was "deeply concerned" over the clashes and called on Nigeria's government to "quickly, credibly and transparently investigate" the events in Zaria. "While many details of the incidents…remain unclear, we are dismayed to learn of multiple civilian deaths," the U.S. Embassy in Nigeria said in a statement. "It is essential that all sides refrain from actions that further destabilize the situation." The statement echoed a similar call from Amnesty International which said anyone found responsible for the "unlawful killings must be brought to justice." “An impartial investigation is urgently needed into these killings," Amnesty's Nigeria Director M.K. Ibrahim said in a statement. “Whilst the final death toll is unclear, there is no doubt that there has been a substantial loss of life at the hands of the military. The Islamic Movement of Nigeria (IMN) is based in Kaduna state and was founded by Zakzaky with the idea that there is "no government except that of Islam," according to Crisis Group. "News of the killings and arrests have sparked protests in several other northern cities," Crisis Group said in a blog post. "These protests, if not managed carefully, could further exacerbate the situation." Nigeria's military — which has long been accused of massive human rights violations — is already locked in a battle with the Boko Haram terror group. IMN and Boko Haram are at odds with each other.